The Bold and the Beautiful (B&B) spoilers for Monday, March 19, tease that Thomas (Pierson Fode) will stop by Forrester Creations to rant about Bill (Don Diamont). It looks like he’ll fill a few family members on the deception he faced. Thomas will point out that Bill’s the one who told him Caroline (Linsey Godfrey) was dying. He’ll still be fuming over the sinister Spencer’s manipulative move. Of course, Thomas isn’t letting Caroline off the hook. Bill may have started the lie, but Caroline went along with it. She could’ve told Thomas the truth from the get-go, but she chose to stay silent and try to score a second chance with him. Caroline took a huge risk and it didn’t pay off in the end. Deep down, Caroline must realize she was a team player here. She’s a grown woman who should’ve known that Bill’s plan would lead to disaster. However, Caroline’s allowing her anger to get the best of her. She may be mad at herself on some level, but she’s taking all her rage out on Bill. The Bold and the Beautiful spoilers say Caroline will tighten her grip on Bill’s neck. As Bill’s breathing becomes raspy, Caroline will continue to gripe. She’ll insist that Bill has no idea how much pain he’s caused. Caroline was bummed back when she was pining for Thomas, but at least they were still on good terms. Now Thomas hates her guts and she holds Bill responsible for that. 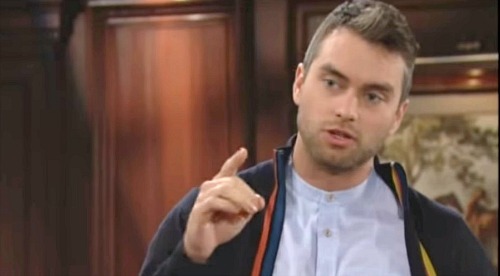 B&B fans can expect some tense moments, but Caroline won’t finish her uncle off. Nevertheless, Bill’s still in bad shape. He’s certainly got a long recovery ahead of him. Despite Bill’s transgressions, Liam (Scott Clifton) hates to see his dad suffering like this. The Bold and the Beautiful spoilers say Liam will open up to Hope (Annika Noelle) about his desire for justice. Liam will note that somebody put Bill in that hospital bed and he wants to know who it was. Hope may agree that they can’t leave an attempted murderer on the loose. There was surely a better solution than shooting Bill in the back! Will Liam be able to find the culprit? Could he beat the cops to him or her? We’ll give you updates as other B&B news comes in. Stay tuned to the CBS soap and don’t forget to check CDL often for the latest Bold and the Beautiful spoilers, updates and news. The Bold and the Beautiful Spoilers: Liam and Steffy Learn Baby’s Gender – Is It a Boy or a Girl?